Display device of a medical monitor as used in anesthesia. Neurological monitoring, such as of intracranial pressure. Also, there are special patient monitors which incorporate the monitoring of brain waves (electroencephalography), gas anesthetic concentrations, bispectral index (BIS), etc. They are usually incorporated into anesthesia machines. In neurosurgery intensive care units, brain EEG monitors have a larger multichannel capability and can monitor other physiological events, as well. A medical monitor or physiological monitor is a medical device used for monitoring. It can consist of one or more sensors, processing components, display devices (which are sometimes in themselves called "monitors"), as well as communication links for displaying or recording the results elsewhere through a monitoring network. Sensors of medical monitors include biosensors and mechanical sensors. The translating component of medical monitors is responsible for converting the signals from the sensors to a format that can be shown on the display device or transferred to an external display or recording device. Physiological data are displayed continuously on a CRT, LED or LCD screen as data channels along the time axis, They may be accompanied by numerical readouts of computed parameters on the original data, such as maximum, minimum and average values, pulse and respiratory frequencies, and so on. Besides the tracings of physiological parameters along time (X axis), digital medical displays have automated numeric readouts of the peak and/or average parameters displayed on the screen. Modern medical display devices commonly use digital signal processing (DSP), which has the advantages of miniaturization, portability, and multi-parameter displays that can track many different vital signs at once. Old analog patient displays, in contrast, were based on oscilloscopes, and had one channel only, usually reserved for electrocardiographic monitoring (ECG). Therefore, medical monitors tended to be highly specialized. One monitor would track a patient's blood pressure, while another would measure pulse oximetry, another the ECG. Later analog models had a second or third channel displayed in the same screen, usually to monitor respiration movements and blood pressure. These machines were widely used and saved many lives, but they had several restrictions, including sensitivity to electrical interference, base level fluctuations and absence of numeric readouts and alarms. 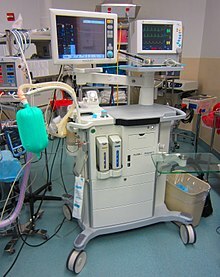 Several models of multi-parameter monitors are networkable, i.e., they can send their output to a central ICU monitoring station, where a single staff member can observe and respond to several bedside monitors simultaneously. Ambulatory telemetry can also be achieved by portable, battery-operated models which are carried by the patient and which transmit their data via a wireless data connection. Digital monitoring has created the possibility, which is being fully developed, of integrating the physiological data from the patient monitoring networks into the emerging hospital electronic health record and digital charting systems, using appropriate health care standards which have been developed for this purpose by organizations such as IEEE and HL7. This newer method of charting patient data reduces the likelihood of human documentation error and will eventually reduce overall paper consumption. In addition, automated ECG interpretation incorporates diagnostic codes automatically into the charts. Medical monitor's embedded software can take care of the data coding according to these standards and send messages to the medical records application, which decodes them and incorporates the data into the adequate fields. Long-distance connectivity can avail for telemedicine, which involves provision of clinical health care at a distance. A medical monitor can also have the function to produce an alarm (such as using audible signals) to alert the staff when certain criteria are set, such as when some parameter exceeds of falls the level limits. An entirely new scope is opened with mobile carried monitors, even such in sub-skin carriage. This class of monitors delivers information gathered in body-area networking (BAN) to e.g. smart phones and implemented autonomous agents. Monitoring of clinical parameters is primarily intended to detect changes (or absence of changes) in the clinical status of an individual. For example, the parameter of oxygen saturation is usually monitored to detect changes in respiratory capability of an individual. When monitoring a clinical parameters, differences between test results (or values of a continuously monitored parameter after a time interval) can reflect either (or both) an actual change in the status of the condition or a test-retest variability of the test method. K, is a factor dependent on the preferred probability level. Usually, it is set at 2.77, which reflects a 95% prediction interval, in which case there is less than 5% probability that a test result would become higher or lower than the critical difference by test-retest variability in the absence of other factors. For example, if a patient has a hemoglobin level of 100 g/L, the analytical variation (CVa) is 1.8% and the intra-individual variability CVi is 2.2%, then the critical difference is 8.1 g/L. Thus, for changes of less than 8 g/L since a previous test, the possibility that the change is completely caused by test-retest variability may need to be considered in addition to considering effects of, for example, diseases or treatments. Critical differences for other tests include early morning urinary albumin concentration, with a critical difference of 40%. The development of new techniques for monitoring is an advanced and developing field in smart medicine, biomedical-aided integrative medicine, alternative medicine, self-tailored preventive medicine and predictive medicine that emphasizes monitoring of comprehensive medical data of patients, people at risk and healthy people using advanced, smart, minimally invasive biomedical devices, biosensors, lab-on-a-chip (in the future nanomedicine devices like nanorobots) and advanced computerized medical diagnosis and early warning tools over a short clinical interview and drug prescription. As biomedical research, nanotechnology and nutrigenomics advances, realizing the human body's self-healing capabilities and the growing awareness of the limitations of medical intervention by chemical drugs-only approach of old school medical treatment, new researches that shows the enormous damage medications can cause, researchers are working to fulfill the need for a comprehensive further study and personal continuous clinical monitoring of health conditions while keeping legacy medical intervention as a last resort. In many medical problems, drugs offer temporary relief of symptoms while the root of a medical problem remains unknown without enough data of all our biological systems . Our body is equipped with sub-systems for the purpose of maintaining balance and self healing functions. Intervention without sufficient data might damage those healing sub systems. Monitoring medicine fills the gap to prevent diagnosis errors and can assist in future medical research by analyzing all data of many patients. The development cycle in medicine is extremely long, up to 20 years, because of the need for U.S. Food and Drug Administration (FDA) approvals, therefore many of monitoring medicine solutions are not available today in conventional medicine. The PASCAL Dynamic Contour Tonometer. A monitor for detection of increased intraocular pressure. In vivo blood glucose monitoring devices can transmit data to a computer that can assist with daily life suggestions for lifestyle or nutrition and with the physician can make suggestions for further study in people who are at risk and help prevent diabetes mellitus type 2 . Bio sensors may provide warnings when stress levels signs are rising before human can notice it and provide alerts and suggestions. Future serotonin biosensors may assist with mood disorders and depression. In the field of evidence-based nutrition, a lab-on-a-chip implant that can run 24/7 blood tests may provide a continuous results and a computer can provide nutrition suggestions or alerts. In epilepsy, next generations of long-term video-EEG monitoring may predict epileptic seizure and prevent them with changes of daily life activity like sleep, stress, nutrition and mood management. Smart biosensors may detect toxic materials such mercury and lead and provide alerts. ^ a b c d e Fraser, C. G.; Fogarty, Y. (1989). "Interpreting laboratory results". BMJ (Clinical research ed.). 298 (6689): 1659–1660. doi:10.1136/bmj.298.6689.1659. PMC 1836738. PMID 2503170. ^ "Healthcare 2030: disease-free life with home monitoring nanomedince". Positivefuturist.com. ^ "Nanosensors for Medical Monitoring". Technologyreview.com. ^ "Brain Damage Caused by Neuroleptic Psychiatric Drugs". Mindfreedom.org. ^ "Medications That Can Cause Nerve Damage". Livestrong.com. ^ a b Hyman, Mark (December 2008). The UltraMind Solution: Fix Your Broken Brain by Healing Your Body First. Scribner. ISBN 978-1-4165-4971-0. ^ "Blood glucose testing and primary prevention of diabetes mellitus type 2 - evaluation of the effect of evidence based patient information". BMC Public health. ^ ""Stress monitoring using a distributed wireless intelligent sensor system"". IEEE. ^ "Using biosensors to detect the release of serotonin from taste buds during taste stimulation". Archives Italiennes de Biologie. ^ Kamel JT, Christensen B, Odell MS, D'Souza WJ, Cook MJ (December 2010). "Evaluating the use of prolonged video-EEG monitoring to assess future seizure risk and fitness to drive". Epilepsy Behav. 19 (4): 608–11. doi:10.1016/j.yebeh.2010.09.026. PMID 21035403. ^ "Multiarray Biosensors for Toxicity Monitoring and Bacterial Pathogens". CRC.